Young Canadian sprinting phenomenon Scott Mulder has just returned from three months of training at the UCI World Cycling Center in Aigle, Switzerland. Mulder will be in tough as he battles five different challengers in match sprints on night two ( Friday Dec 28) of the Superior Glass 4 Day presented by Wolfe Auto Group. Each round will have a dollar value to it and each round Mulder wins that dollar value goes up. If Mulder loses the challenger takes the pot. Mulder, 20 years of age from North Vancouver, is a 7 time National Champion and has recorded top ten results at the Jr World Championships and most recently 8th at the Elite UCI World Cup in Manchester UK. Racing commences each night at 6:30 PM and runs to 11 PM. 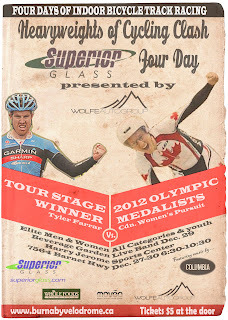 Tickets at the door for only $5 with free admittance to those under 10 and free indoor bike parking. 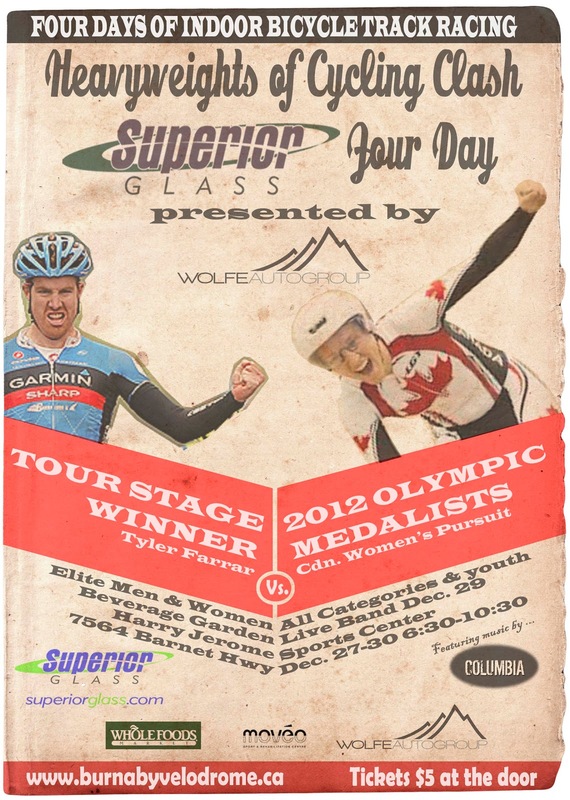 The event also features amateur categories and the Future Stars of Cycling youth races. Each night the infield hosts a refreshment garden and concession stand, and Saturday night features Columbia, one of Vancouver’s hottest bands with their stadium rock sound. The first 50 entrants get a free Columbia CD! The final evening pits the Canadian Women’s Team pursuit squad vs. Tour de France stage winner Tyler Farrar in the Wolfe Auto Group 3km pursuit grudge match. Come out and find out who stands in the center of the wooden oval with their hands raised in victory. 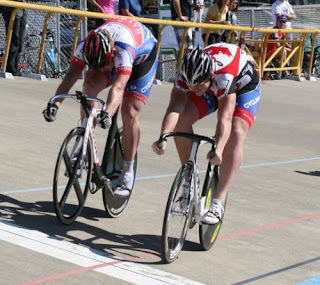 The Burnaby Velodrome is located at 7564 Barnet Hwy in Burnaby. Visit www.burnabyvelodrome.ca for full details. Let's bring the gambling back to North American track racing!